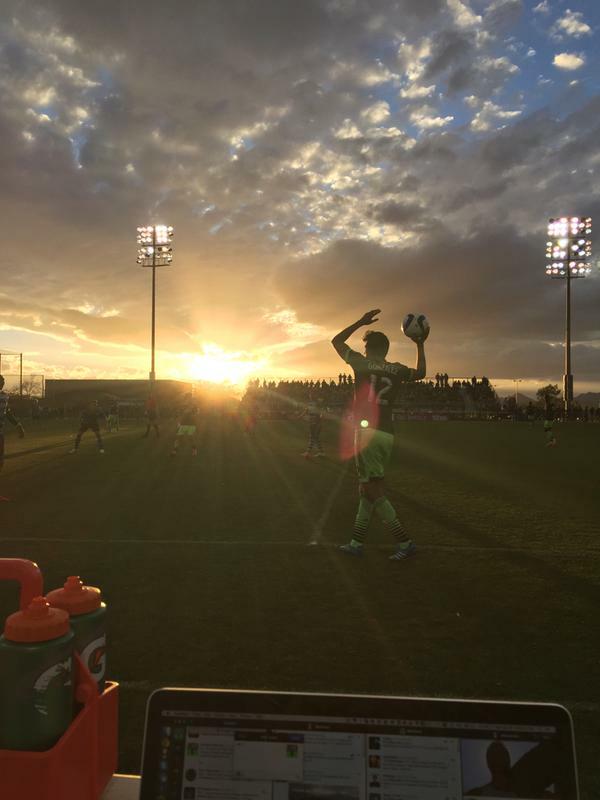 Seattle Sounders FC takes on Sporting Kansas City in the team's final match of the 2015 Desert Diamond Cup in Tucson, Arizona. 11’ - Sounders getting forward with that quartet of Martins, Dempsey, Pappa and Neagle. A chip over the top to Oba causes trouble but clear. 13’ - Things getting a little heated now as Azira sees yellow and the Sounders get into the ref’s face a bit contesting the call. 15’ - Oba dropping in a bit deeper now to pick up the ball. Some nice turns and flicks, as is tradition. 15’ - In other news, Wiz head coach Peter Vermes is nowhere to be seen. 17’ - Short ball from Pineda to Dempsey warrants a discussion…in Spanish. That was fun. 18’ - All Sounders on the ball here. Really nice movement in the midfield. Asking some questions. 19’ - Longggkggg FK comes in from Pineda down the far side but it’s got a wee bit too much on it and it goes out on the near side. 23’ - …a breakaway at the other side. Good no calls on both sides there. 25’ - Looks like Lopez is going to come back in after all. Neat! 26’ - Ridiculous #LeoBall into Oba who CHESTS out wide to Dempsey. Just real fun stuff. 28’ - More good movement there from Seattle. Very good stuff. …and then a turnover. Figures. 32’ - Sounders get up the pitch again with Pappppppaaaa but he’s defended well and we’ll have a corner. 32’ - Ball whipped on in but too high and it’s cleared. Sounders pressing here. 33’ - How’s your touch, kid?! Ball cleared out on the near side by me and the ball boy takes the lofted ball with ease. Making it look easy. 33’ - Impressed with his skills, Kenny Cooper goes over and gives him a high five because Kenny Cooper is amazing. 34’ - And now Kenny gave him a brand new Sounders hat and took a picture with him. Dang it, Kenny…just too nice. 34’ - Sounders with their best chance there. Ball sent through the area by Dempsey and Martins and Neagle inches from tapping it home. 36’ - Ohhhhh boy. Yellow for Hallisay as he looses possession and takes out Neagle. Deep FK coming here. 38’ - Wonderful play there by Martins, Dempsey and Lamar. Ball played in by Oba nearly reached by the pair but Melia out to take just ahead. 40’ - Sounders really turning the screws now. Mears getting forward and darts into then box. His cross is blocked nicely by Sinovic. 41’ - FK chance now for Seattle. Pappa to bend it on it from the near sideline area. 41’ - Sent in nicely but cleared by Servando Carrasco. Remember that guy? He’s a good dude. 44’ - Clint and Gonzo. Just silky smooth connections in the middle of the park. They get it. 45’ - Foul called on Gonzo there inside the Sounders half. Good FK chance for the Wiz coming up. 45+ - Two minutes of stoppage time. That’s one and two minutes of stoppage time. HT - The sun has come out and I can’t see the field. Cool! 46’ - No subs for Seattle. New goalie for SKC. 48’ - Ball swung in by Pappa on the far side and a good clearance is necessary. Sounders right back at it here in the second period. 49’ - Leo gets forward now and swings in the cross that Lamar meets but he’s under it and puts it over the bar. Drag. 50’ - Neagle sees yellow for arguing there. Oh boy. 51’ - Corner from SKC goes right to Frei who goes long for Martins but JUST too much. 54’ - Lamar gets forward and gets the cross into the box. Before it even gets there Gonzo hits the deck no foul called. Ok then. 56’ - Good work by Lamar tracking back and sliding the ball out of play right in front of me. 57’ - OH SAVE MADE BY KEMPIN! Dempsey with a beautiful run forward and tries the flick to hit the far corner but the dive stops him. 57’ - Another shot, another save! Dempsey to Martins who goes across the goal but Kempin there to keep it out.